You may select which tools to add on the left menu of your class. 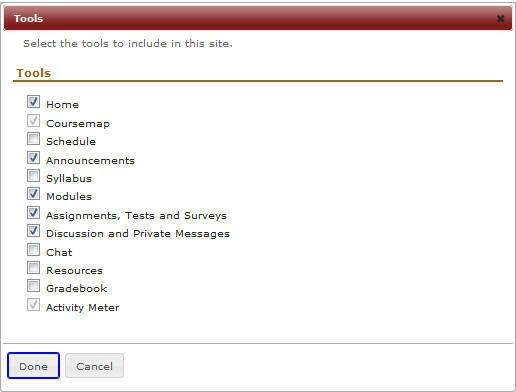 To enable or disable tools from your course site’s left menu, click on Site Setup on the left menu. You can also enter Site Setup from My Sites (top menu of Dashboard). Click on Edit to the right of Tools. In the dialog box that opens, select the tools you will like to use in your course site and uncheck those that you’d like to remove. Click on Done to save your options and close the box.